With EW putting Divergent stars Shailene Woodley and Theo James on the cover of their magazine, we knew we'd be seeing some new photos from the film, and the site has not disappointed. Yesterday, we shared a look at Tris and Four by the ferris wheel, and today we're looking at some other stills, and the above promotional image, which appears to be from EW's photo shoot of the two stars, and teases Tris and Four preparing to leap from a moving train. Because that's something Dauntless people do. Waiting for it to stop is for the other factions. Directed by Neil Burger, Divergent is based on a soon-to-be-trilogy of novels by Veronica Roth. Set in dystopian Chicago, where society is broken up by five factions, which determines a person's way of life, the story centers on Tris Prior (Woodley), a teen who learns she's Divergent, and will never fit into any one particular faction. Still, she chooses her faction and begins her training, which is how she meets Four (James), her trainer, who takes an interest in her. The film is in production in Chicago now, with a release date set for March 21. 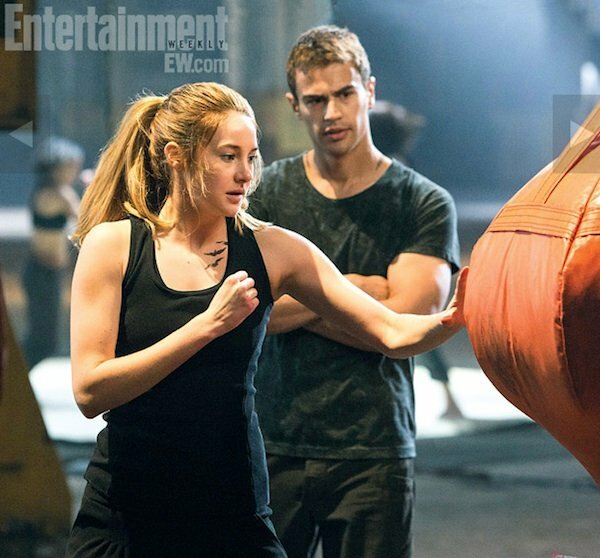 Among the new photos EW shared is the one below, which shows Tris training, and Four standing behind her looking tough and intimidating. Like the EW cover, this one gives us a glimpse of Tris' three-ravens tattoo over by her collarbone. The birds signify the three family members she left behind. And in this one, Tris appears to be body surfing. (Vague spoiler-speculation on this scene after the image!). Spoiler-speculation ahead: Without going into too much detail on one of the big moments in the book, I'm guessing this scene takes place after Tris gets through a particularly daring unofficial part of her training. And we're seeing her faction members accept her as one of their own. Assuming that's the case, it's kind of a spoilery moment to reveal in such an early photo, but I suppose it's a great tease of what comes before. And if you haven't had enough of seeing Four standing behind Tris, EW has one more image, which shows her looking pretty happy as she enjoys target practice (assuming it's just practice) while Four stands behind her. In addition to Divergent's arrival in theaters, we also have the debut of the third and final book in the trilogy, Allegiant, to look forward to, not to mention the e-shorts Veronica Roth is planning on publishing.